A low rotation speed paired with a vertical juicing screw allows squeezing the juice up to a single drop retaining all nutrients. 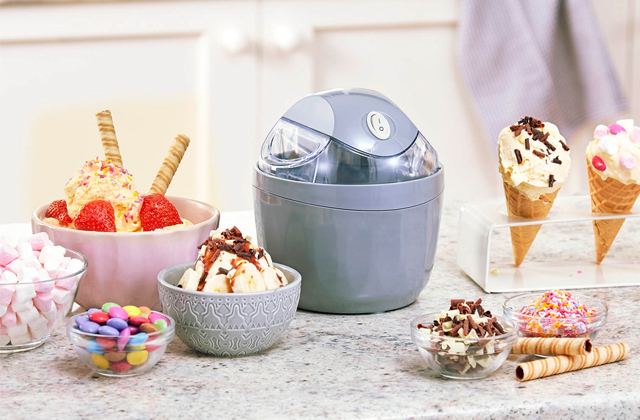 Besides, an innovative frozen attachment will let you create refreshing icy cocktails and desserts. Instruction booklet is not detailed enough. The Panasonic slow juicer is a truly functional and reliable appliance that will be of great use for all fresh juice enthusiasts. Featuring a vertical design, the unit is convenient in use and will take minimum space on your countertop. In addition, you can choose between 3 colour designs. A special pulp removal technology will let you produce large amounts of juice without having to stop the unit for cleaning from time to time. There might appear some leaks due to untight connections. 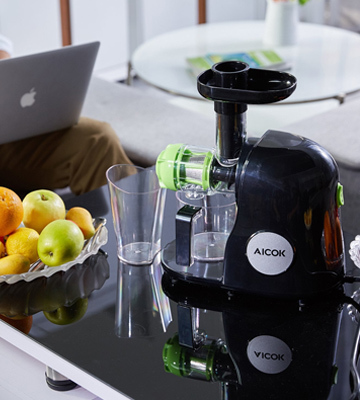 Unlike many other models in its class, Aicok juicer offers truly silent operation generating the noise level lower than 60dB that makes it a good choice for home use. Operating at slow rotations, it will make consistently smooth and nutrient-packed juices from your favourite fruit and veggies. A horizontal design of this model ensures the highest quality extraction of soft leafy greens. Thus, you'll be able to make a whole variety of green juices and healthy cocktails containing times more antioxidants and fibres. 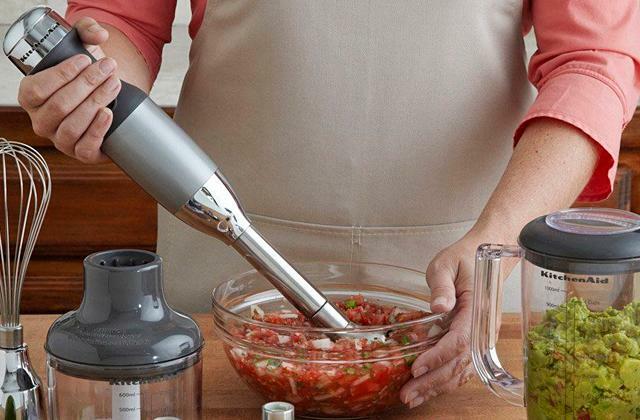 Thanks to a powerful and quiet motor, the ElectlQ juicer delivers consistently high performance irrespective of the hardness of ingredients you load it with. 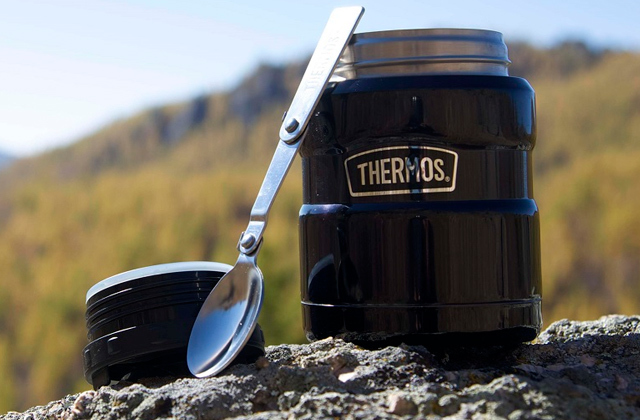 Made from solid hygienic, and non-toxic materials, the unit is wear-resistant and is absolutely safe for the food. Enjoy healthy juicing and enrich your healthy diet with a variety of juices. Thanks to the fairly low speed of the DC motor (45 RPM) and the vertical juicing screw, you get fresh juice full of all useful nutrients. 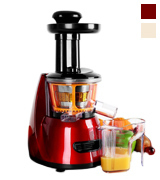 Plus, with all-copper motor construction, a long lifespan and quick operation of this juicer is a guarantee. Some may find it a bit noisy. 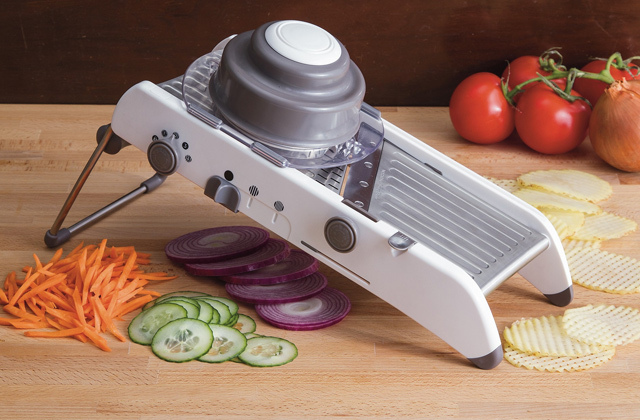 Let this cold press juicer by Excelvan prepare a delicious and, most importantly, healthy veggie or fruit juice for every member of your family. It has a pretty stylish design, intuitive control, not to mention that it takes no time at all for the appliance to produce a large amount of juice. This Vertical Slow Juicer Extractor is a great appliance when it comes to making fresh and healthy juice quickly and effortlessly. Besides, with a specially designed safety lock system, the juicer won't start working when you don't actually need it to. It is recommended to let the motor cool after 10 minutes of use. If efficient juice extracting and user-friendly design are of the highest priority to you, the Klarstein cold press juicer is an option for you. It doesn't leak or splash the liquid through the process, consumes very little power, and lets fruit and veggies preserve most of the useful vitamins they contain. 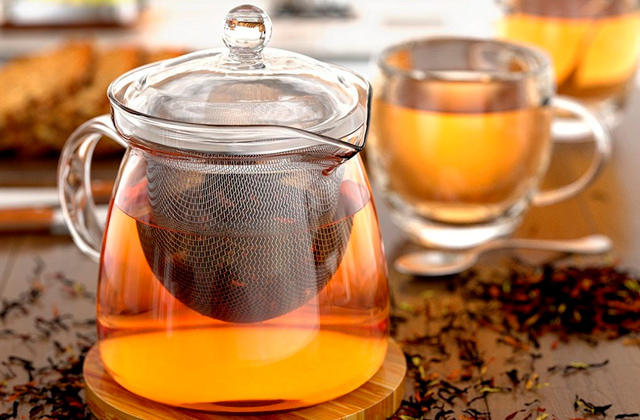 Plus, it has a pretty stylish design, so it will blend into any kitchen interior perfectly. For years, manufacturers from Japan have been setting the pace in technologies and innovations. All Japanese products stand out for top quality and consistently high performance. Panasonic is not an exception. Within 100 years from the day of establishment, the company has become a globally renowned electronics giant and made a number of essential technological breakthroughs. Today, the manufacturer produces the whole range of products from high-end electronics and premium optics to first-class home appliances and personal care products, all distinguished by a combo of a well-thought design and smart technological solutions. 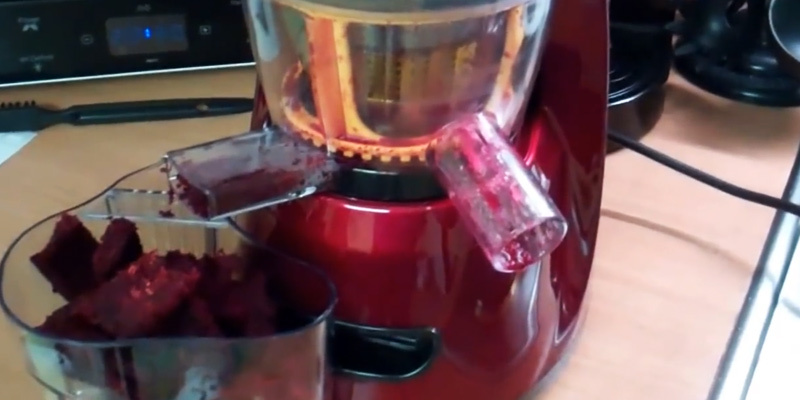 And this is exactly what you will get with a cold press juicer from Panasonic. Though a juicer is not a high-tech appliance, the manufacturer did not step aside from its quality standards and designed a modern and highly functional unit for easy and efficient juice extraction. The first thing that will impress you about this model is how slim this juicing machine is. Created in best traditions of Japanese minimalism, it features no excess details and boasts a truly elegant and compact design. Being pretty tall, the unit comes complete with a steady base that also won’t take up more space on your countertop than a conventional kettle. Yet, behind this compactness, there is a powerful juicing extractor delivering high-performance and fully meeting its intended use. Combining a vertical design of centrifugal juicers and a low-speed compression technology, the Panasonic MJ-L500NXC presses and slowly squeezes the juice retaining all nutrients and vitamins and producing no heating or oxidation effect. A tough and durable stainless steel screw is wear-resistant and can handle all kinds of produce, be it hard root crops and vegs or soft juicy fruit and berries. And no need to peel or extract pits since the system is designed to remove dry pulp through one spout while smoothly thick juice will come out the second spout, both pulp and juice going to separate containers included in the set. A plastic pusher tube will help force ingredients into the feeder mouth while a drip stopper will cover the spout when you take out a tank full of juice. 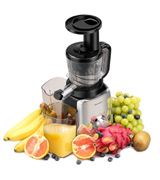 After a juicing session, you can easily disassemble the unit to several parts for easy cleaning and convenient storage. Designed with user convenience in mind and build to last, the Panasonic slow juicer is a reasonable investment for any juicing enthusiast. It will serve you for years and take the strain out of juicing process allowing you to enjoy healthier nutrient-dense juices. Instead of drinking store-bought processed and pasteurized juices containing preservatives and sugars, more and more people prefer squeezing fresh juices which are times healthier coming packed with essential vitamins and amino acids. Being a real depository of vital nutrients and elements, fresh juices are also amazingly delicious and might serve a base for a number of cocktails, sauces, energy boosting drinks, and desserts. If you are into healthy eating and fresh juices are an integral part of your diet, an efficient and functional cold press juicer from Aicok will help you get the best out of fruit and vegetables and diversify your daily menu. 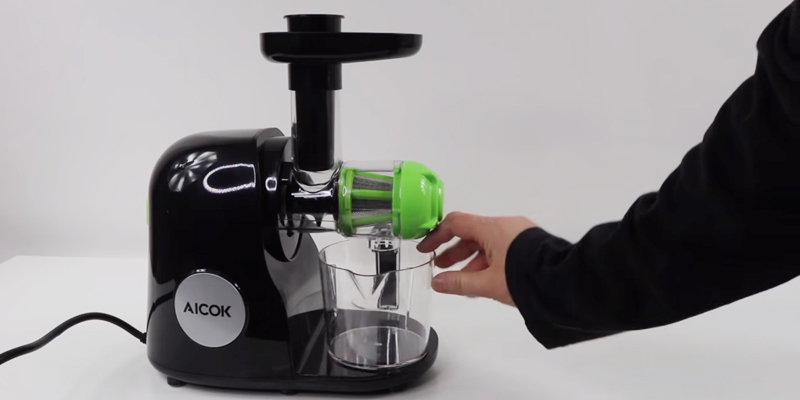 At a glance, you will notice, that the Aicok is completely different from centrifugal juicers most of us get used to. It looks somewhat like a meat grinder with an auger placed at a right angle to the unit body. Similar to vertical juicers, this model applies the same slow juicing principle when the screw crushes and presses the produce against a metal sieve to squeeze the juice and can handle the same variety of hard or soft fruit, vegetables, and citrus. The major difference lies in ingredients preparation since you will have to stone, pit, and peel fruit and vegs except those with soft seeds. Yet, thanks to a horizontal design, the Aicok juicer ensures higher juice yield delivering much drier pulp and works better for leafy greens and wheatgrass. Besides, it reduces heat and oxidation to the minimum which means healthier juice and more easy-to-absorb natural vitamins and minerals. Though working at a slow speed rate, this machine juices pretty fast and it will take you only several minutes to get 2 or 3 glasses of freshly squeezed juice. 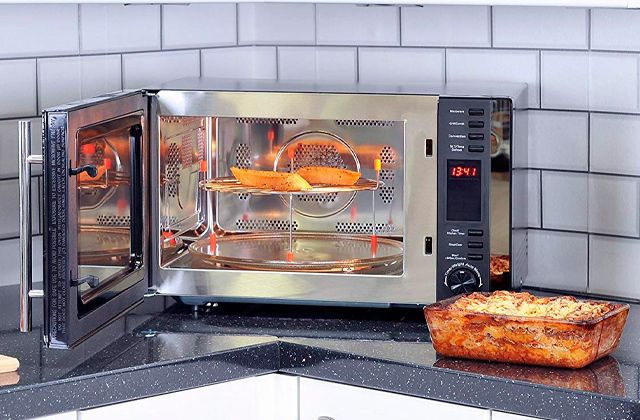 Despite its horizontal design, the Aicok AFF-91781-HMLW is very compact and won’t take much space on your countertop. The unit body and auger are made of solid high-quality plastic while a rotating shaft and juicing screen are made of first-class steel. All materials are non-toxic, environmentally friendly, and durable ensuring the ultimate unit safety and longevity. Non-skid feet will provide stability and steadiness on any surface, be it plastic, glass, polished wood, or stone. And you will definitely enjoy a low-noise unit operation since the motor runs rather quietly producing the noise level below 60 dB. 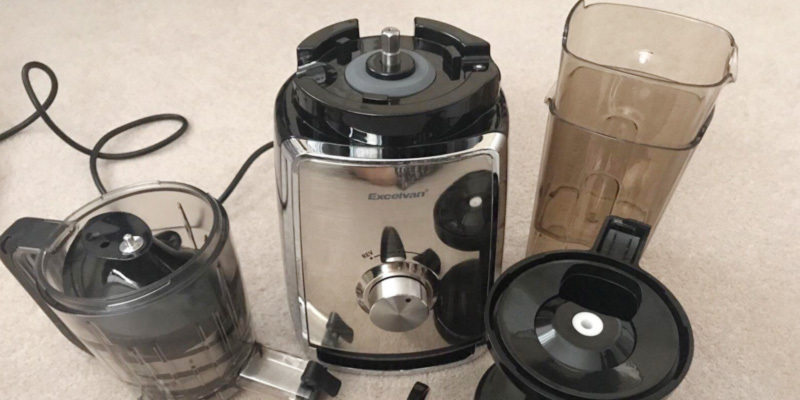 When it comes to maintenance, the juicer is quick and easy to disassemble to rinse the constituent parts under running water or clean them in a dishwasher. 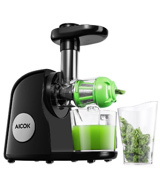 The Aicok horizontal slow juicer is a great choice for health-conscious users who like green juices and to retain maximum natural elements and nutrients when juicing. Trying to enrich their menus with natural enzymes, micronutrients, and minerals, many people eat fruit and veggies to replace fatty and sugary snacks and some even drop into juice bars to have a glass of freshly squeezed juice. Yet, regular visits to a juice bar might add costs to your budget while making your own juice at home is more cost-effective and will let you experiment with ingredients to customize your own blend. 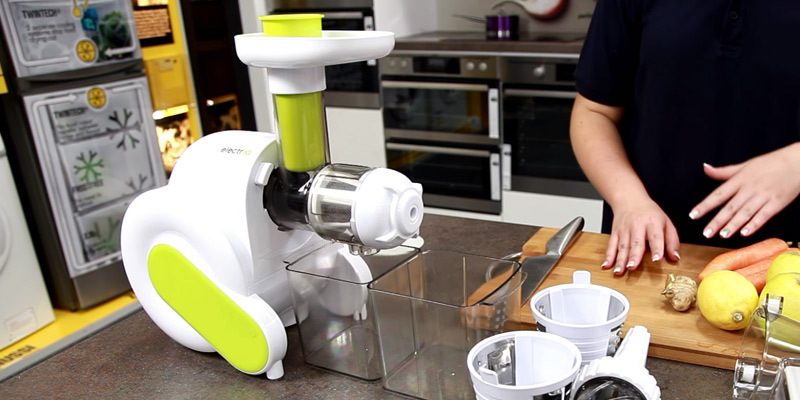 Want to make fresh juices at home? 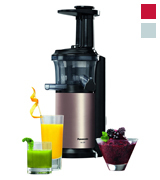 Then turn your eyes to a slow juice extractor from ElectrIQ. 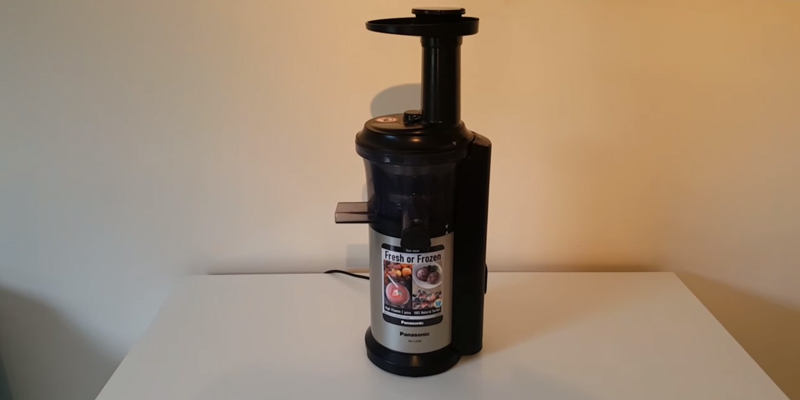 Cold press juicers are usually more expensive than centrifugal models, yet, the ElectrIQ HSL 600 offers functionality and efficiency you’d expect from this type of juicer at a fairly reasonable price. A low-speed auger masticating technology used in this model paired with a horizontal design will maximize the juice yield greatly reducing the waste. Besides, this model is a pretty good energy saver too since the unit motor runs with 150 Watts in contrast to 800-Watt motors in centrifugal juice extractors. 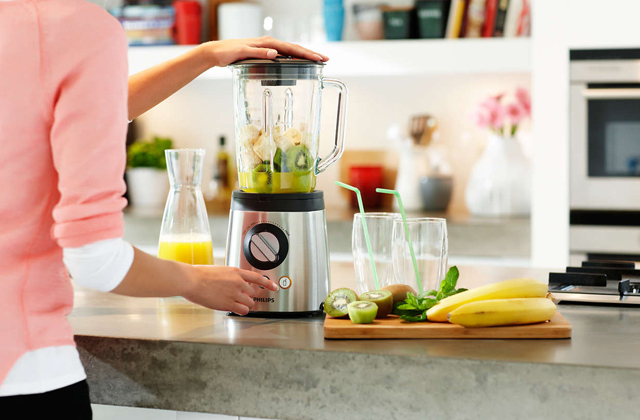 Spinning at only 80 RPM, the ElectrIQ juicer will create perfectly fresh, rich, and delicious juice without losing any nutrients that is often caused by high-speed juices due to heat build-up and higher oxidation level. A forceful stainless steel auger can handle all kinds of fruit, berries, and veggies, be it soft peaches, apricots, bananas, cherries, plums, strawberries, and tomatoes or hard apples, pears, cucumbers, carrots, beetroot, and cauliflower. As a result, you’ll get concentrated and flavourful juice much thicker than watery juices from other juicers. 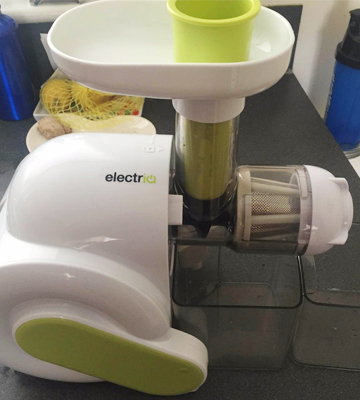 On top of that, the ElectrIQ is one of the slow juicers that work excellent on leafy greens and wheatgrass. Owing to a horizontal design, it will create less foam saving you the trouble of straining your green juice afterwards, while thanks to a narrower screw, it will squeeze fibrous plants more efficiently allowing you to enjoy the healthy goodness of raw spinach, parsley, celery stems, kale, cilantro, or even aloe and pine needles. As functional as it is, this cold press juicer is compact fitting any household kitchen, boasts a quiet operation which is also great for home use and is extremely easy to clean that will save your time when cooking breakfast and making a pitcher of orange juice for the family.Though the juicer comes disassembled, the assembly is a real snap and won’t take more than 5 minutes. And the unit will turn on only when everything is assembled correctly as it has a built-in safety lock ensuring you won’t have any accidents. Affordable, efficient, versatile, and easy to use and maintain, the ElectrIQ juicer is by far the best juicing machine for making a whole variety of fresh juices saturated with minerals, vitamins, and antioxidants at home. If eating clean is your priority and a glass of fresh juice full or vitamins is how you envision a good start to your day, this cold press juicer by Excelvan will become your reliable assistant. For starters, since only a slow extraction process helps you preserve the majority of healthy nutrients and vitamins, the best cold press juicer is the one that takes its time when extracting juice without overheating its components. 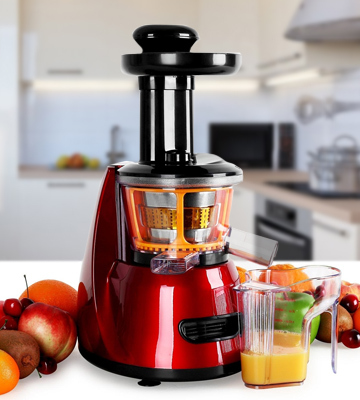 So, aiming to produce the top-quality juicer that will be able to provide the best quality juice, the manufacturer has equipped this model with a 150W motor that works at 45 RPM. Though this speed might seem too low for some, the motor is powerful enough to handle pitted fruits and citruses in a blink of an eye. There is also a special controller that turns the juicer off automatically in order to prevent the motor from overheating, thus protecting the machine and the quality of your juice. 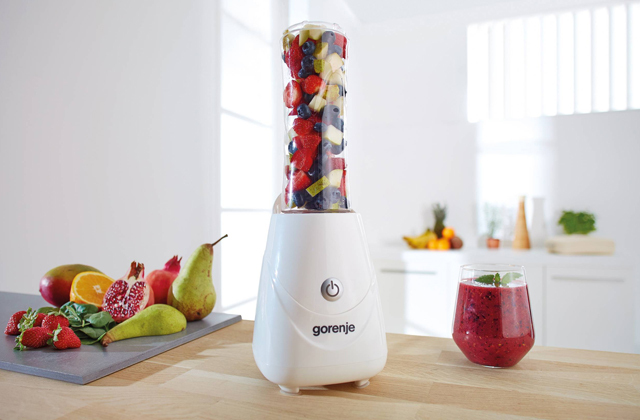 Nevertheless, the manufacturer does recommend you to make short breaks to let your juicer cool down. 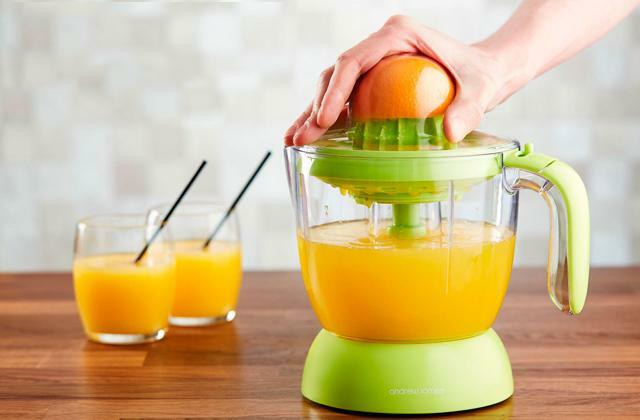 As for the maintenance of this juicer, most users find it pretty simple because, with a specially designed 3-in-1 squeezing screw that pulls in the food automatically, they don’t spend much time on its cleaning. Plus, there is a rather convenient cleaning brush to remove very small sediments, which simplifies the process quite a lot. Containers for juice and pulp that come in the box are of standard volume (600 and 350 ml), which is enough for two glasses of juice, yet you might need to keep an eye on their filling when making larger portions. To be honest, the cold press juicer by Excelvan seems like a pretty simple device at first sight. However, thanks to its low-speed juice extracting system, this model was able to attract plenty of customers all over the world. All in all, if you want to drink fully vitamin-enriched juice, Excelvan is exactly what you need. Many parents will agree that it can be rather challenging to make your kid choose a glass of fresh juice over a can of Coke. Especially when it comes to veggie juice that is so indispensable for our health, but, frankly speaking, is not very delicious. Indeed, it is hard to blame our children when they refuse to drink cabbage juice with spinach or parsley. But if you add an apple or any other sweet fruit into it, the situation changes greatly. So, talking about cold press juicers, the ability to mix any fruit with vegetables is a severely underrated feature. 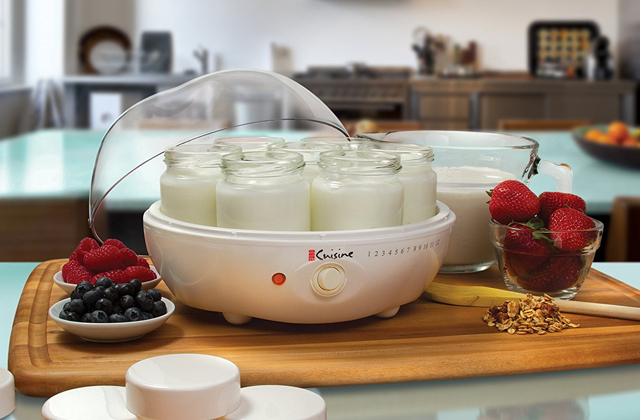 Fortunately enough, the Klarstein OJ3-FRUITPRESSO is one of these models since, thanks to its powerful motor with a speed of 70 RPM, your options when it comes to creating a unique flavour are virtually limitless. Basically, all you need to do for that is remove seeds from fruits if there are any and place them in the juicer. After that's done, it will do all the hard job for you. A few minutes later, a fresh, tasty, and, more importantly, healthy juice is ready for you to enjoy it. Sounds great, right? This vertical cold press juicer is also safe and user-friendly. And that means that, with the start-stop protection, the device won’t turn on if any of its parts are installed improperly. Cleaning the juicer won’t take away too much of your time either because, with such a well-thought-out design, there will be no clogs for you to remove. In other words, you will only need to clean the extractor under running water using a cleaning brush. 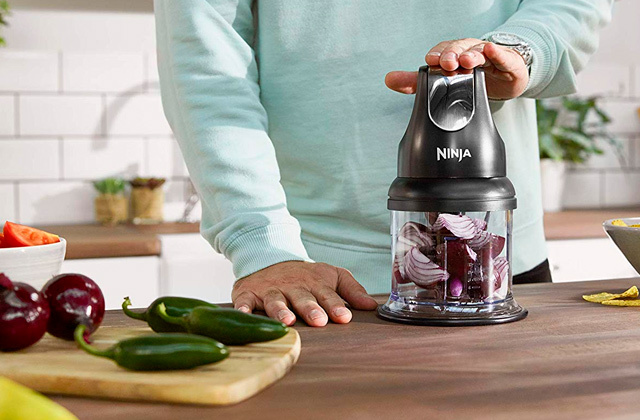 Finally, thanks to rather compact design, the juicer won’t take much of your working space, which makes it ideal for a small kitchen. 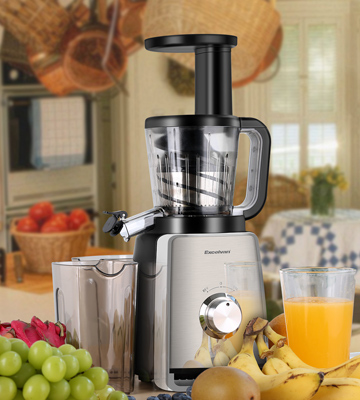 Overall, if you are looking for a high-quality and efficient cold press juicer that will help you please your family members with a healthy and delicious juice on a daily basis, this model by Klarstein will be the right choice for you. After all, being well-made, reliable, and effortless in use, this juicer will prove to be an irreplaceable device for any kitchen out there. With healthy eating recently being a modern trend, juicing is also gaining more popularity. And for a good reason since it is an easy and efficient way to deliver the necessary minerals, nutrients, and fibres locked in fruit and vegs to our body. Hence, today, a juicer is a common appliance you can come across almost in any household kitchen. Yet, it’s worth saying that different types of juice extractors are not equally well on handling both soft fruit, solid roots and vegetables, and fibrous leafy greens. They might often produce rather watery juices leaving a lot of pulp that still contains precious nutrients. Thus, in strive to improve and maximize the juicing process, the newest generation of juicers has appeared. These are cold pressure juicers. 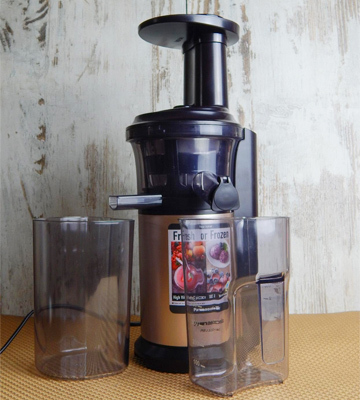 Commonly, a cold press juicer system includes a crushing or cutting element breaking fruit and veggies to release juice and an auger (reminding a drill bit) that squeezes the juice from the pulp against a screen filter. Also named slow juicers or masticating juicers, cold press juice extractors rotate at low speeds that causes no heating while juicing but makes the juicing process longer. Yet, despite taking more time to juice, a masticating juicer will squeeze nearly every drop from the pulp-producing much thicker and more nutrient-dense juice. Besides, unlike many other juicers, this type works great on all almost fruit and vegetables including even plants with low moisture content such as bananas and cauliflower, and soft leafy greens such as spinach or wheatgrass. 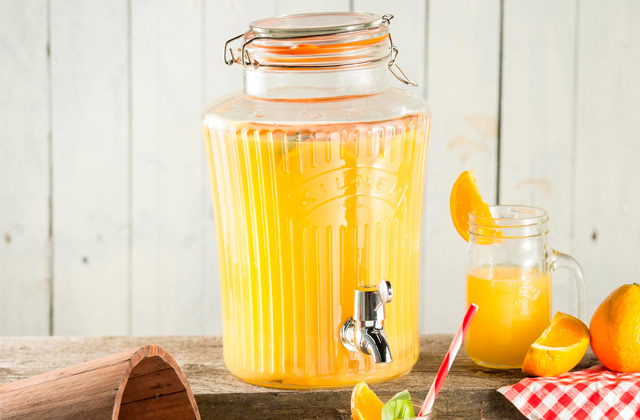 If you get used to starting your day with a glass of orange juice, a simple and affordable citrus juicer will help you separate juice from any citrus fruit quickly and without a hassle. 1. Juicer Buying Guide, Food Matters. January 18, 2017. 2. 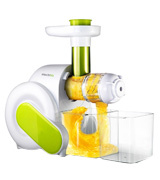 Fiona Mair Juicer buying guide, Choice. December 7, 2017. 3. Juicer, Wikipedia. January 30, 2018. 4. Juicer Types: The Difference Between Cold Press Juicers vs. Centrifugal Juice Extractors, HuffPost. July 22, 2013. 5. Cold Pressed Juicer (Slow Juicer) Buying Guide, Kent. March 8, 2017. 6. Paula Martinac List of Health Benefits From Drinking Natural Juices Extracted From Raw Food, LIVESTRONG.COM. October 3, 2017. 7. Anna Nguyen Juicing for Health and Weight Loss, WebMD. 8. Jackie Newgent The Juicing Trend - About Raw Juice, Eat Right. June 23, 2015. 9. Katherine Zeratsky Is juicing healthier than eating whole fruits or vegetables? Mayo Clinic. July 16, 2016.